Gaffa tape – what can’t be mended with gaffa tape? With any kit that you carry in the outdoors you want it to be as versatile as possible and gaffa tape ticks that box. Wrapped around your water bottle, gaffa tape is a versatile, low-bulk, low-weight piece of kit that might just save the day on many a day. Other than being extremely good at mending boots, commonly gaffa tape can be used to tape feet to help prevent blisters or, following a traumatic accident, it can be used to help improvise and to bind splints to limbs. Nothing too controversial here – standard first aid kit. They can be used to stem blood loss, tie in splints, or soaked in water, can be used to cool a hyperthermic casualty by wrapping the sodden cloth around the casualty’s neck and wrists. Given the choice between these and any other bandage – these would be the ones I’d choose. And, don’t buy the heavy cotton ones that you’ll use on a first aid course. Instead get yourself some Calico ones for under a pound a piece. These pack small and weigh next to nothing too. Personally I carry three. Pretty much, treat every casualty, every day of the year for hypothermia. (Ok so there will be maybe one day in the summer months when this might not be true!) To that end kit items #3 & #4 are half a roll mat, and a shelter of some sort. “Half a roll mat! ?” you exclaim. Well, like any decision we might make in the outdoors let’s weigh up the pro’s and con’s. Costs – half a mat doesn’t cost that much. In fact you get two for the price of one – less than £5 last time I looked. Weight – a half roll mat weighs around 250g – you won’t notice it. Bulk – a roll mat cut in half and rolled inside your bag so that it’s like any extra liner requires negligible space. It’s a non-issue. So with no reason not to carry one, what are the reasons to carry one? It holds my bag nicely open for me and stops it caving in when I go to grab stuff from it. It works a treat as an extra layer of waterproofing – especially when the rain is really blowing into you sideways on. When I take my kids out for a walk, all three of us can fit on it side by side when we have a bite to eat. If you should ever be benighted you’ll have something to kip on! I can sit an immobile casualty upon a mat and it will help maintain circulation and help prevent them from getting pressure sores. This is especially important for the unconscious casualty. In addition, for the immobile casualty who may have some time to wait for help, the added insulation from the ground is invaluable. (See if you can sit on the ground outside for as long as it takes you to read this post – you’ll see my point). Rolled around a limb they make for an excellent improvised splint. If need be, with the help of a pen knife, the mat can be cut down further to create an improvised neck brace. (Always assume trauma to the spine/neck following an outdoor accident). Half a roll mat, costs little, weighs little, takes up no space and is hugely versatile. What’s not to like? Short of being a fell runner, I can’t see why anyone wouldn’t carry one of these. (You can buy yours here now). Half a roll mat is only half the story however. That’s the insulation taken care of – how about the shelter? For me, depending on what I’m doing and where, I take different size shelters. 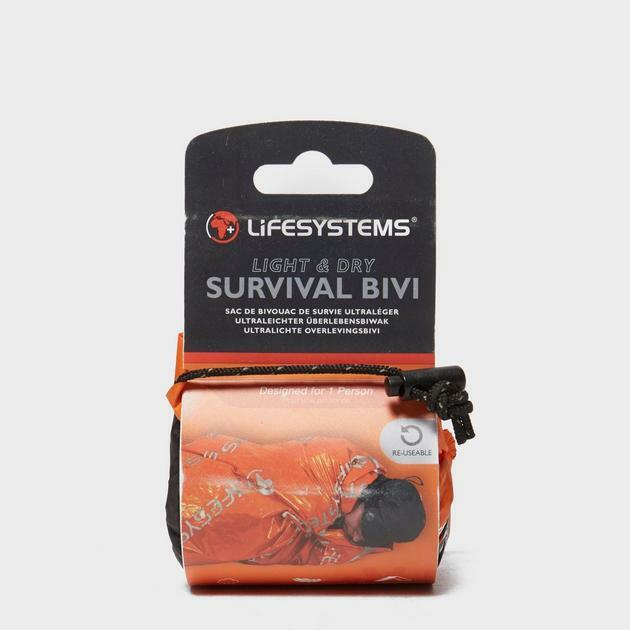 If I’m out running in the hills I carry a lightweight Lifesystems Light and Dry Thermal Bivi. It’s a double skinned survival bag that weighs next to nothing and packs down so small it is easily carried in the back pocket of a cycling jersey. But if I’m out with a group I prefer to carry a group shelter. These should be at least capable of sheltering 6 adults. Anything smaller and you won’t be able to give shelter to a prone casualty within the canopy. Insulation and protection for the outdoors is essential. In the urban environment the casualty is far closer and more speedily rescued to A&E. In the outdoors you could be waiting a long time in very cold and wet conditions. As a first-aider in the outdoors, chances are the best thing you can do for your casualty is keeping them from getting any colder. Leave this kit in the shops at your/their peril! You are potentially the first on the scene. Hence you are best placed to record what has happened there and potentially before the casualty has lost consciousness. One aspect of using the casualty card is that you use it to monitor and record the casualty’s vital signs: pulse, breathing, colour, temperature, and state of alertness. In turn it keeps you focused on how the casualty’s condition may be changing. As you gain information you’re better able to make decisions. Recording the vital signs and recording them every five minutes means that when the medics arrive they have an idea of how your casualty is progressing: getting worse? Getting better? Staying stable? And this is the best reason in my experience for using a casualty card – it makes you, a humble first aider, look incredibly professional and this is hugely reassuring to the casualty and to anyone with them. It costs practically nothing, it weighs practically nothing and this one piece of first aid kit is enormously beneficial. So if you don’t already carry one in your first aid kit – now’s the time to get online and to print a few off. Nb. All the kit listed in this post carries the central theme of being low-weight, low-bulk whilst also being very versatile. All items could be of huge assistance in many situations. I have also assumed here that you will be carrying gloves automatically. If it’s a summer’s day and you don’t have any gloves packed, you’ll need to add some blue nitrile gloves to the list too! These advanced 4 day expedition first aid courses are aimed at training outdoor professionals and travellers who operate overseas in wilderness environments that are far from help. Will Legon (of Will4Adventure.com) works professionally in the outdoors leading groups walking and instructing single pitch rock climbing. Since 2009 Will has been delivering first aid training specialising in outdoor first aid courses. He is an ITC (Immediate Temporary Care) trainer, offering a range of courses accredited by Ofqual and the SQA. In a former life, Will was a maths teacher and an infantry officer in the Territorial Army. Will4Adventure are specialists in outdoor first aid running regular courses every month. This 2 day course aims to equip the novice with the hill and navigational skills to safely navigate paths and tracks on UK hills in summer conditions. 16 hour (two day) outdoor first aid training for outdoor leaders and enthusiasts alike. This accredited course will revalidate ML, SPA, MIA, BASI, BCU etc. I have just done the fear of heights course and it was absolutely amazing. I did so many things that I thought were impossible. Brian's session in the morning was really good and I went into the afternoon calm. Jamie and Adam were brilliant they were encouraging and calming. They explained everything and gave you as much time as you needed to have a go. The way it builds up so you just push yourself a little bit more is good and when you have reached your limit that is ok . The group of people I was on the course with were excellent everybody was encouraging and helped each other. When I reached the top of the climb on the Sunday I felt capable of anything. Thank you so much Jamie, Adam and Brian. I will be back to do some more climbing. The Outdoor First Aid course I attended was excellently run, well organised and well equipped. Will is obviously massively experienced in the outdoors and very good at passing on his knowledge and experiences in ways that make it easy to remember. It's also a lot of fun! Ideal course for anyone leading groups in the outdoors. Great teaching style, lots of hands on practice and gives the qualifications needed for ML and various activity holiday companies. Thanks to Will and his team I've just completed the epic 30 mile Welsh 3000s. If you're up for a walking challenge, this is it!! Great walk. Great guides. Great achievement! Hill Skills 1 - Navigation course. Had a great day out with Will in the Peak District learning the basics of map reading and compass work. Feel so much more confident now and able to wander off the beaten track without getting lost. A superb teacher, really made it simple to understand and a very patient guy! Topped with beautiful weather for the day and not forgetting the company of Monty the springer spaniel who had endless amounts of energy. Thank you for such a great day Will! Started 2017 on top of the world with Will4adventure. Trip to Mount Toubkal exceeded all my expectations.